MySQL can store data using a handful of different storage engines. Almost all installations of Open Dental use the MyISAM storage engine. For large offices, MyISAM tables lock up for short periods of time when complex queries are being run (e.g. running the recall list). For example, you may notice that Open Dental is usually fast, but when you perform certain specific actions or run certain tools Open Dental locks up for a short period of time on all computers. Update to the most recent version of Open Dental to ensure a bug isn't causing slowness. Follow the steps on Troubleshooting Slowness. Bring the slowness issue to the attention of Open Dental support in case there is a bug that needs to be fixed. As a last resort, consider switching the storage engine from MyISAM to InnoDB. The MyISAM storage engine locks at the table level and the InnoDB storage engine locks at the row level, so InnoDB does not run into locking slowness as often as MyISAM does. Replication Warning: Offices using Replication will need to disable replication on all servers prior converting the database. It is suggested that you call and speak with a Replication Coordinator at Open Dental before this process is started. These steps are for advanced technical users and will cause all databases within the database server to be converted to Innodb format. MySQL version 5.5 must already be installed. Review your backup/restore strategy before converting the database to ensure that you know how to validate restored backups. It will probably involve a dump to text file instead of copying files. You will not be able to use Open Dental's built in backup/restore tool. Make certain that all users stay out of Open Dental during the conversion process. This could take a couple of hours depending on the size of the database. Make a backup copy of the data folder for safety. Typically found in C:\mysql\data. Change the my.ini file to include the InnoDB specific items (see below). Launch the database through the Open Dental application. Go to Tools, Database Maintenance. 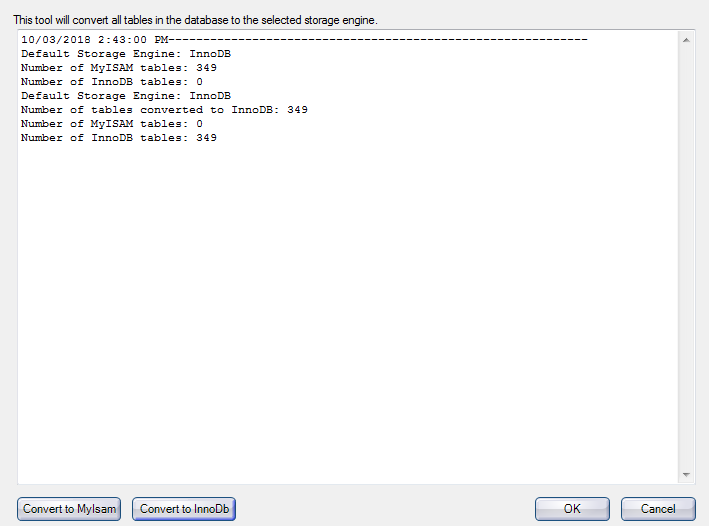 Select the Tools tab and click InnoDB. Use the interface to convert all Open Dental tables from MyISAM to InnoDB. This process will take a long time since it is rewriting all of the database tables. Ensure that it ends successfully. All of the tables in the database should have changed from three files per table (FRM, MYD, MYI) to two files per table (FRM, IBD). Your database tables will now all be in a single file rather than separate files inside a folder. If you have multiple databases on your server you will need to follow steps 6 and 7 for each database. 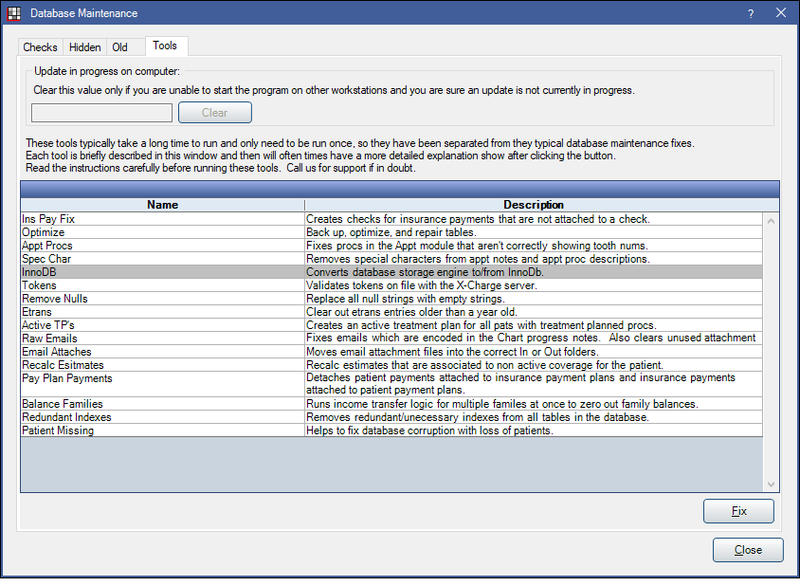 This database type will not function with the Open Dental backup tool, or most online backups. It is important to have a backup plan in place prior to making changes. Stop the MySQL service. Ensure that it stops without errors. Copy the MySQL Data directory.